Workout Playlist | Keep It Up, David! This entry was posted on Tuesday, April 17th, 2012 at 1:03 pm and is filed under Uncategorized. You can follow any responses to this entry through the RSS 2.0 feed. You can leave a response, or trackback from your own site. Those are my go-tos. 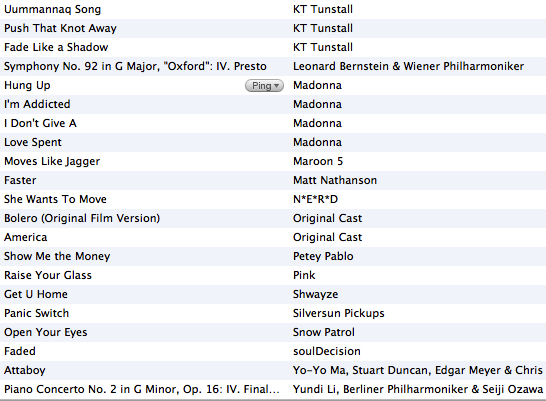 My workout playlist is much hip-hoppier than my overall taste in music, but is also fairly eclectic. Forgot all about Tambourine – I love that song! I’ve already downloaded and added to the list. Thanks, K! This is so timely! 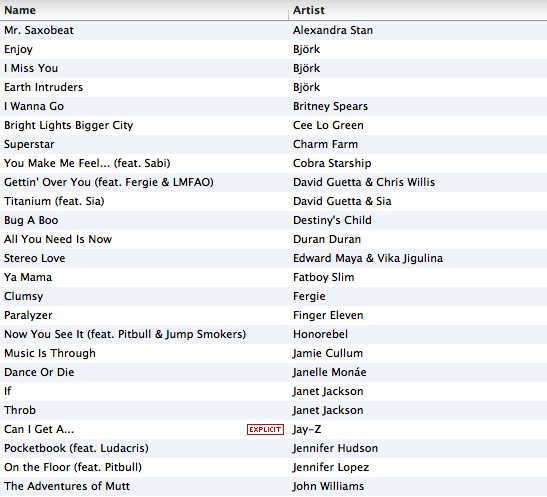 I downloaded 101 running songs this afternoon and am making a workout playlist for myself. Thanks for sharing. Thanks for sharing your playlist, David! I added a few of yours to my list. How do you print a copy of the playlist onto your post? I would like to print out my playlist and I’ll give it to you the next time I see you in class. I think I have about 6 hours of music now. I took screen grabs of my list using the “Grab” program on my MacBook, and uploaded them as jpgs to my blog. 6 hours of music, wow! That’s some playlist! See you soon. Thanks! I printed out my list and tucked it in my workout bag. Will give it to you the next time I see you. Hope your foot is better. There’s a lot of Bjork that I won’t work out to, either, but some of it has a great beat. I’ve been a huge fan for 15 years, you wouldn’t believe how much Bjork music I have! I am not a fan of mainstream music until it comes to working out, Kelly Clarksons – Stronger is my favorite new song to work out to. I usually repeat it at least five times during my workout. Keep up all your hard work, you’re good imspiration! Thank you, Holly! I do the same time sometimes – listen one song on repeat all throughout my workout. We know what we like! Love a lot of your songs, I listen to a weird mix of songs, but they all make me want to move, which is the point!